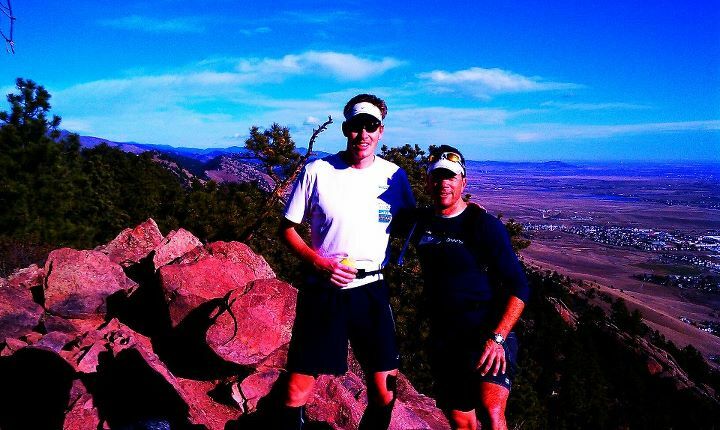 I made the mistake of noting my start and stop time on a run to the top of Mount Sanitas a few months ago. Of course then each subsequent run had to the beat the time from before. And then it wasn’t just a “sometimes” run, it was a weekly run. And then I was running it twice a week. I hit the internet to see if I could find out what a “good” time to the top actually was and I landed on this site (http://www.wwwright.com/climbing/speed/sanitas.htm) which lists nearly every permutation of conquering that mountain you could come up with. Shortly after realizing my times paled in comparison to the fastest time, I saw someone had run five loops to the top and back. I was instantly drawn to it and a quick text and response from David Glover gave me a running buddy. The game was on. We were off on the wrong foot when the forecast predicted sustained winds from the west up to 50 mph with gusts up to 100 mph (http://www.dailycamera.com/ci_19327805?IADID=Search-www.dailycamera.com-www.dailycamera.com) . And of course our ascent was on a westward facing ridge. However, as we headed out around 8, the conditions were only moderately breezy. Our course was up the west ridge approaching from the south and heading back down and home on the north side/valley trail. My initial goal was 5 hours leaving 1 hour per loop, but I thought 4:30 was possible. The climb up Sanitas is steep and rocky with endless 2-3 foot step ups and virtually no place to recover. You go 1300 feet up over 1.2 miles and 1.8 miles down and home. The first two ascents weren’t that big of a deal (25:05/25:40 mins) and we decided to reverse direction on the 3rd loop and head up the valley floor. It was on this loop that I felt the onset of the will to aggressively cover the course beginning to slip away. This direction was a longer way up and took us 30 minutes which was still a good time, but we both knew we were going to be entering the pain zone soon. It was about this time Mother Nature delivered in earnest on her predicted winds. The wind was literally blowing me over boulders on the descent and I was aggressively hitting the breaks for fear of being launched like a champagne cork down the trail. It did make for our fastest time down from the summit though despite a number of near wipeouts. The 4th ascent may have been the hardest because it wasn’t the last and the wind was at its worst. I was leaning in at a 45 degree angle digging in like a lineman pushing a tackling dummy just to make any progress at all. Periodically a gust would come along and stand me straight up and back on my heels. Just as quickly, the wind would shift directions and blow me across the path. This was quite unnecessary for quads that were already being pushed to their limit. Later in the day when I took a shower I was washing dirt and pieces of leaves out of my ears that had been blown in there. I struggled to keep up with the Glover, but managed to hang in and we submitted in 26:46 which I was pretty happy about given how we felt. The runs down were getting particularly tricky now as they were very technical (and neither of us are skilled) and the fatigue had set in on our legs in earnest. Upon finishing lap number 4 I realized not only should we beat 4:30, we had a chance to go under 4 hours for the run. My quads attempted to protest any time goals, but my brain (at rest anyway) was all for it. The spring in my step was long since gone and the initial stages of climb 5 had me questioning the rational for doing 5 loops. Whereas overtaking someone on the trail was normally a mental boost, I was now dreading it because I feared a total collapse at any moment and absolutely embarrassment as I crawled into the fetal position in front of someone I just passed on the trail. Right around the halfway mark I had to take my first break and take about 5 seconds and regroup. Glover was strong and I sort of yo-yoed from right behind him to 10 yards back over the next few minutes until I could see the summit about 5 minutes away. I told myself “no more stopping” but several thousands 1 legged squats hoisting my 200lb carcass up this mountain caught up with me and all screamed at once to “stop!”. After one last 5 second recovery I vowed to keep going to until I was at the top. Several minutes later I tapped the lap button on the watch at the summit in 27:46 and collapsed in exhaustion on rock that had been my friend 4 other times today. Glover and I snapped a quick picture and then headed down the trail. Sub 4 was easily in our grasp, but smiles turned concern as wobbly legs led to a face plant by Glover. Bruised and scraped, but not broken, he walked it off and again sub 4 was ours. But one final test came when I completely bonked hard with .25 miles to go. I was fine, then out of nowhere my legs buckled, eyes fogged over and it was like my head was a balloon and someone just let the air out. 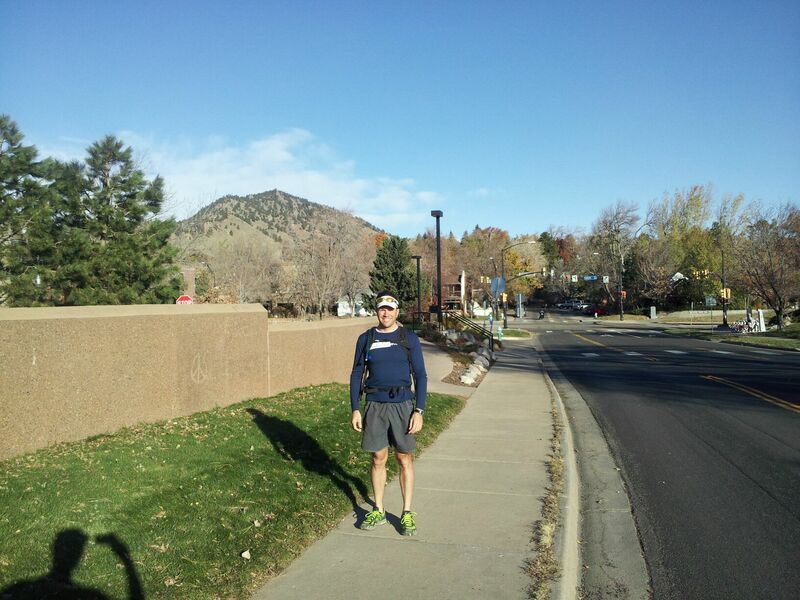 After about 30 seconds I ran again and with some sense of urgency….sub 4 was nearly slipping away. We managed to make it in 3:58 but I had to walk most of the mile home because I was flat out out of gas. I’ve never fueled for an event quite like this with its hard/easy thing and I obviously didn’t do it right. I felt like absolutely crap for a couple hours, but some food and a short nap had me right as rain…rain that walks with a slight limp, a bit of a grimace and drinks a Red Bull to make it through the rest of the day, that is. This entry was posted in Crazy Adventures, Running, Training. Bookmark the permalink.